Byron Dooley came to Oregon's Willamette Valley in 2004 because it's become pretty clear that it's one of the greatest places in the world to grow Pinot Noir. As he established himself, he had designs on two labels. One became Seven of Hearts, a label that gave Byron an opportunity to lean on his experience producing a range of wines in California while allowing him to explore both the varietals and AVAs of Oregon and Washington state. 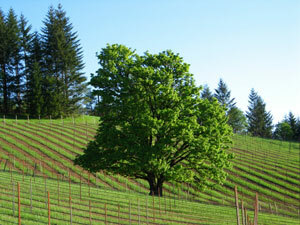 The second label, Luminous Hills, allows Byron to hone his focus on why he originally came to Oregon; the Pinot. The thinking behind Luminous Hills is a Pinot Noir geek's dream. It kind of went like this: select a cool site in a proven Pinot producing area, find a potential vineyard site that has soil variation, elevation difference, and varying slopes and aspects all in within a single parcel. Byron and his wife hit the jackpot and planted their vineyard in the Yamhill-Carlton District AVA. With half of the equation in place, they went about planting a variety of clones in distinct blocks that would be defined by their soil type along with clone and elevation pairing. When it came to selecting his clone and soil type, Byron was looking for specific flavor profiles and structure out of his fruit and site pairing. He laid down Pommard on the sedimentary Willakenzie soil as the vineyard's foundation. Byron wanted dark fruit and rounded mouthfeel from his Pommard/Willakenzie combination. He sought high tone character, red fruit and minerality in planting Dijon clones on the higher elevation, volcanic Jory soils. Byron's aim for all of this is to produce Pinot Noir wines that reflect an Old World attention to clone selection, blending and soil. He wants to make it less about fruit and more about the minerality, texture and spice that is a true reflection of the vineyard. The result of all his hard work in the vineyard and in blending are three different Pinot Noirs in bottle. Byron's approach has been to blend various clones as well as integrating whole cluster fermentation at varying amounts in his three Pinots: the standard bottling, the Lux and the Astra. What you'll experience with the Luminous Hills Pinots and what Byron is after in his wines is nuance and subtlety. These are not big boisterous Pinots - there's enough of them out there already. He's attained that by toning down the fruit elements and shifting the focus to the minerality and spice elements of Pinot Noir. Byron is looking to perform artistry by moving the minerality and the spice to the fore to highlight these elements of Pinot Noir that often find themselves in the background. This shifts the focus on fruit characters to the periphery. In a recent post I did on the Oregon Wine Blog I sampled one of Byron's 2008 Pinots and likened its nose to a classical Burgundy I had just days before, a 2004 Chambolle-Musigny. The 2009 releases saw alcohol levels soar from the '08 releases up to 15%. The vineyards are dry-farmed and Byron is unwavering in his committment to make the wine that the vineyard gives him. The ripeness and high sugars which produce the higher alcohol were accompanied by great phenolic characteristics as well. This gives the wine great balance and integration. He's done a masterful job integrating the alcohol in the wines and they retain that Burgundian elegance in their aromatics that I noted in the last vintage. All of the '09 Luminous Hills display a freshness to the fruit character with a paler brick red color, which Byron tells me is due to the whole cluster fermentation. While I often expect a lighter Pinot to be light bodied, these Luminous Hills Pinots buck that trend with full body and rounded structure. The standard bottling Pinot Noir (priced at $28 with 357 cases made) displays dried floral notes, hints of rose petal and violet, brighter fruit elements (raspberry in particular) and a touch of spice in the aromatics. The palate brings that spice out further in the finish, while the front palate continues that fresh fruit theme with loads of minerality throughout. The Lux (priced at $35 with 147 cases made) continues with the floral nose and brings fresh bright cherries into the aromatics. The palate displays a hint more complexity with the whole cluster fermentation turned up on this wine. Plums appear with dried fig and a dusty earthen quality. We once again experience the spice on the back palate and into the wine's finish. The Astra (priced at $35 with 98 cases made) exhibits similar aromatics as found in the standard bottling with additional hints of lavender and nutmeg. The palate offers up some of the brighter fresh fruit of the standard bottling, (the two wines share a lot of similarities in clone selection), as raspberries make an appearance alongside cherries and toasted almonds, the spice from now 60% whole cluster fermentation finishes out the wine. 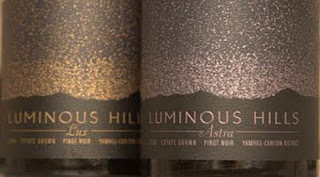 The wines that are being made at Luminous Hills are clearly the subject of much consideration on the part of the grower and vintner, Byron Dooley. What he's done in his painstaking preparation is help Oregon Pinot Noir drinkers find some of the range that this varietal and growing region can offer. While Oregon offers a bit more complexity and nuance across the board when compared to the ripe warm Pinots of California, there tends to be a style that the wines trend towards. Byron has left that trail behind a bit and in so doing, allows Oregon Pinot Noir fans an exploratory opportunity in the Yamhill Carlton District, (given all the effort that Byron has gone through to craft these wines, these are beyond reasonable price points). The 09 Luminous Hills wines are drinking lovely young, but given their tannic structure, it will be interesting to see them in a few years. We have been drinking Byron's wines for a couple of years now, and first fell in love with it on our first wedding anniversary trip. There really is nothing like his wines, his story, and of course his wife's chocolates to accompany it. Its great to see his wines featured here! These are fantastic wines. The Luminous Hills Vineyard is just a gorgeous place, and I learned a lot on a tour with Byron. I'm going to be featuring his Seven of Hearts white wine program on Northwest Whites soon. Love these wines. Really great post. I've heard some solid buzz surrounding these wines, but haven't gotten my hands on any yet. I'm excited to see where you take this blog---glad to be one of the first subscribers. Robert, Thank you for all the compliments. I encourage you to check out the Pinots. I haven't had the Seven of Hearts stuff but I trust what Ryan has said about them above.